Bite of the Week: Soft Shell Crab Louis! April 4, 2019 / Mr. 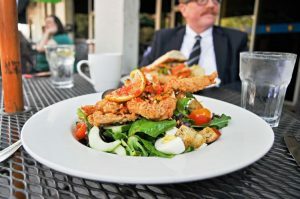 Friendly / Comments Off on Bite of the Week: Soft Shell Crab Louis! I have a nostalgic bias when it comes to soft shells, which I first tried at Mr. Friendly’s, one sautéed, one steamed, with no breading. It was like eating the marsh on the first spring-like day, when there’s just enough warmth in the air to take off your shoes and feel the sun. An uncoated, steamed or sautéed soft-shell crab is a delight, but so is one breaded and fried to crispy perfection. A recent lunch special at Mr. Friendly’s, the Crab Louis salad, keeps this fried treat light. Crisp lettuce and cucumbers, sweet grape tomatoes, and blue-crab roasted corn salsa are the perfect match for the fried soft shell. The salad’s wedges of hard-boiled egg put it in a league with Cobb and Niçoise salads, but with a superior protein. Crab Louis (also spelled Crab Louie) is a classic dish whose history is hard to trace. It may (or may not) have been served first on the West Coast, possibly in Seattle, or maybe in San Francisco, in the early 20th century. The dressing most often resembles Thousand Island or occasionally Russian, chef’s choice. Like many classic American dishes, the origin and exact recipe is untraceable, meaning interpretations are endless. Mr. Friendly’s particular iteration, with fried soft shell instead of just the typical lump crab, is the perfect way to enjoy a soft shell crab for lunch. Mr. Friendly’s is open for lunch Monday through Friday from 11:30 a.m. to 2 p.m. and dinner Monday through Saturday from 5:30 p.m.